A Russian-built Proton rocket carrying the MexSat-1 communications satellite launches from Baikonur Cosmodrome in Kazakhstan on May 16, 2015. The rocket failed about eight minutes after liftoff. An investigation into the failure is underway, they added. Saturday's crash came less than three weeks after a malfunction with a different Russian launch vehicle, a Soyuz rocket, doomed the robotic Progress 59 cargo mission to the International Space Station. Progress 59, loaded with about 3 tons of food, fuel and other supplies for the orbiting lab, launched atop a Soyuz from Baikonur on April 28. But shortly after separating from the Soyuz, Progress 59 began spinning wildly, and engineers were never able to get it under control. The cargo craft died a fiery death over the Pacific Ocean on May 7. A preliminary investigation revealed the failure stemmed from a too-early separation of the Soyuz's third stage, Roscomos officials have said. A final report about the Progress 59 crash is expected to be released Friday (May 22). The Soyuz is currently astronauts' only rocket ride to the space station. As a result of the Progress 59 incident, NASA, Roscosmos and its partners decided to push the next crewed Soyuz launch back by two months, to late July. This move, in turn, impelled the partners to keep three astronauts who were scheduled to come home last week on board until early June. Saturday's accident, meanwhile, marked the seventh major failure of a Proton rocket in the last 4.5 years, and came nearly a year to the day after the most recent one. 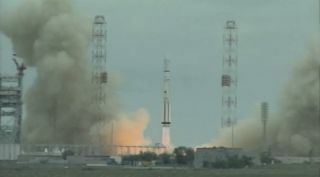 On May 15, 2014, a Proton carrying the Express-AM4R communications satellite went down just nine minutes after launching from Baikonur. The Proton rocket family has been in operation since the 1960s. The Proton-M is a 174-foot-tall (53 meters) launcher with three main stages, though many of its liftoffs also incorporate a fourth stage, known as the Breeze-M.
Proton rocket launches are marketed by International Launch Services, a Russian-U.S. joint venture based in Virginia.